Welcome to the worlds greatest guide to Women's Pants. Are you actually looking for Women's Pants? Well, we hope you are because the reality is that you have found our Women's Pants page. Apparel Search is a leading guide to fashion, style, clothing, glam and all things relevant to apparel. We hope that you find this Women's Pants page to be helpful. What are pants? Come on, you already know the answer. Pants are the same as trousers. In the United States they are typically called pants and in British English they are often referenced as trousers. Regardless, they are essentially clothing worn on the lower half of the body often from the waist to the ankles and covers both legs separately. Pants don't have to reach all the way to the ankles, but they do have to cover both legs separately. If they don't cover the legs separately you might actually be wearing a dress or skirt. Women’s pants includes casual, business (wear-to-work), night out, special occasion, formal and other categories of design. Ladies pants come in a wide assortment of styles, fabrics, and colors. 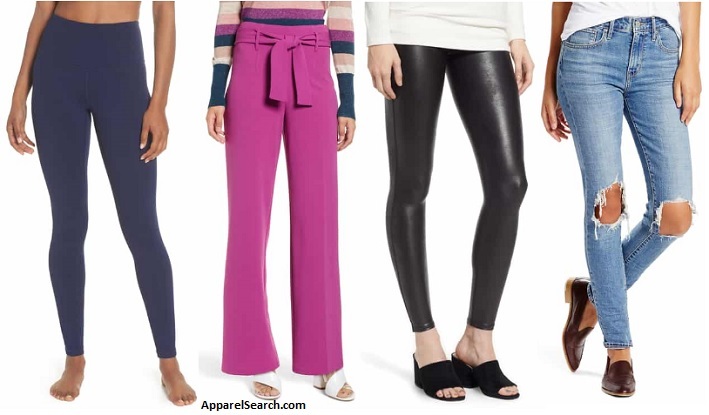 A few examples include cropped, ankle-length pants, relaxed-fit styles, pleated trousers, fold-over linen flares, designer denim, stretch twill capris, slim-legs, wide-legs, skinny fit, straight-legs or more. Learn about various types of pants for women. You can find women’s pants with stretchy blends, hidden hook-and-eye closures, five-pocket styles, and more. You may also want to research printed pants such as camouflage pants. Don't forget, shorts are also pants. If you want to be even more stylish, you should wear your favorite Women's Pants. Visit your favorite retailer to find the latest styles of women's pants in a variety of patterns and materials.